Lunch on own at restaurants nearby. After adjournment, attendees are free to visit the three local covered bridges. 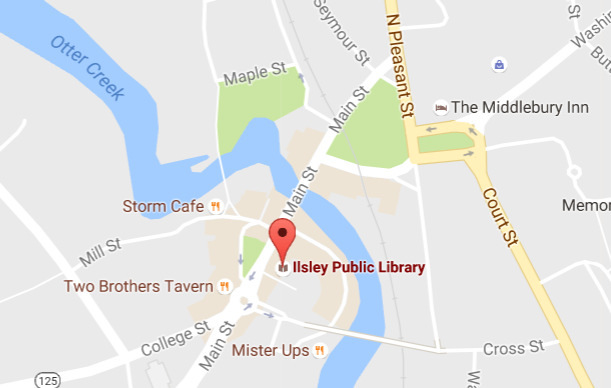 The meeting is in the public room of the Ilsley Library (go to rear, take ramp to downstairs room). Because there is a new bridge connecting downtown Middlebury with Route 7, there is a new way to reach the parking area that serves the library. The road to the parking area comes off the south side of the west end (downtown end) of the bridge and goes under the bridge to the parking spaces. Since the upper level spaces have a two-hour limit, it would be best to use the lower level spaces. Coming from the north on Route 7: go through downtown, get on the roundabout at 6 o'clock, leave it at about 9 o'clock but do not enter the bridge, instead take the road to the right which is the lower lot for the library. Coming from the south on Route 7: proceed across the bridge and immediately at the end of the bridge and on the right is the entrance to the upper level parking lot behind the library.